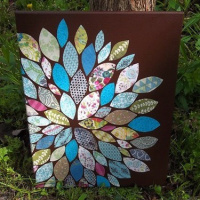 Get inspired with these 20 ways to Mod Podge canvas! 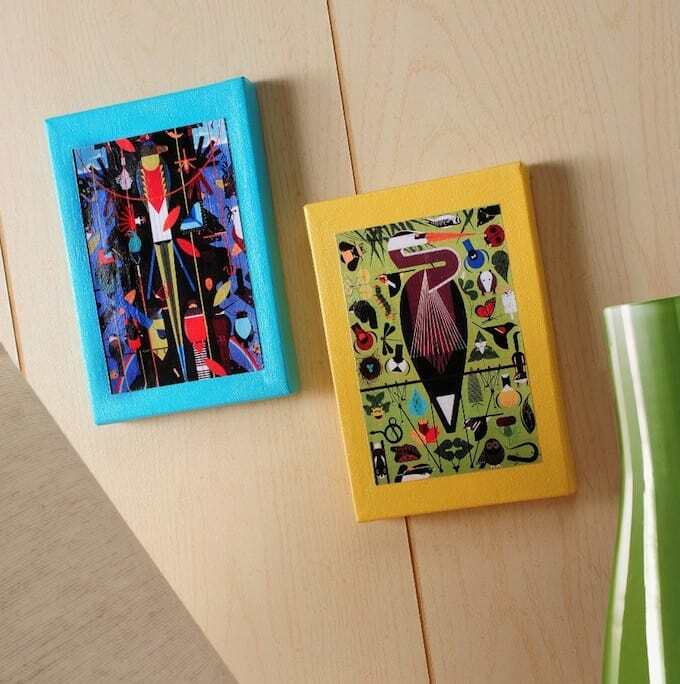 Ranging from very easy to intermediate, you'll love this variety of canvas art ideas. 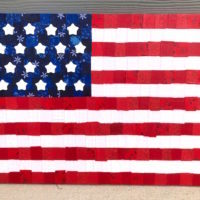 Scroll down to the bottom of the post to get a video of some affordable family wall art being made by my friends Cathie and Steve. Such great inspiration! 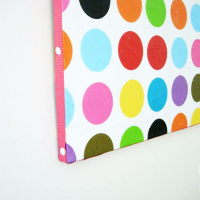 Are you looking for some great ideas for Mod Podging a canvas? I've pulled several together for you. The truth is, I love Mod Podging on canvas and making wall art. It's a blast, and so easy. Sometimes people look at a blank canvas and they just aren't sure what to do with it. I mean let's face it – we're all not Picasso. If you told me to freehand paint something on canvas, you'd probably be disappointed. That's why I like DIY wall art with Mod Podge so much. I promise that all of the ideas included in this post are achievable, and you don't need artistic talent or training to do them. You can have canvas art to decorate your walls by this afternoon! Before we jump into the DIY wall art projects, I think it's important to answer a few questions that I get regularly. Read these before you Mod Podge on canvas. What are standard art canvas sizes? I try to encourage people not worry about about canvas sizes for their project. You should get a canvas to fit the space you are eyeing and then size up or down as needed. Having said that, I really like the 16″ x 20″ canvas size for wall art. It's substantial enough; not too small and not too large. If you have no idea what size to start with, try the 16″ x 20″. What paints to use on canvas? I recommend, since you aren't painting masterpieces, just using an acrylic paint from the craft store for these canvas art projects. My favorite acrylic paint is FolkArt Multisurface as well as Martha Stewart. The color palettes for both of these lines are awesome, and the paints flow really well on canvas. They also cover really well. What can you use on canvas besides paint? 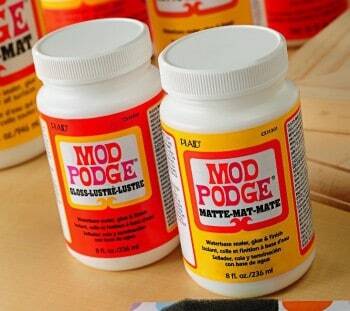 Just about anything, if you have a bottle of Mod Podge! I've used felt, cardboard, scrapbook paper, fabric, jewelry, stamps, Sharpie, coloring pages, and more. Learn what you can use with Mod Podge that won't bleed. Do you need to prime canvas for acrylic paint? Generally speaking, you don't. Most of the canvas I buy at the craft store is pre-primed, so I don't have to worry. Even if you buy canvas for DIY wall art and it's not primed, you'll be fine just to start painting. Having said that, you might have to add a few more coats of acrylic paint just because it will soak in. The paint also won't flow quite as well across the top of the canvas. What you can do if you want to prime your canvas is paint it white, or add a coat of Mod Podge over the canvas. Then you can paint on top with ease. Should you paint the sides of a canvas? Yes, I always do, especially with the gallery wrapped canvases. This is because I typically don't hang canvas items with a frame, so you can see the edges and tell that they are unfinished. Sometimes I wrap the fabric or paper around the sides too. The only time I would leave an unfinished edge is if I were going to frame. Use enough Mod Podge; be liberal. Any that squeezes out the sides, just wipe away. 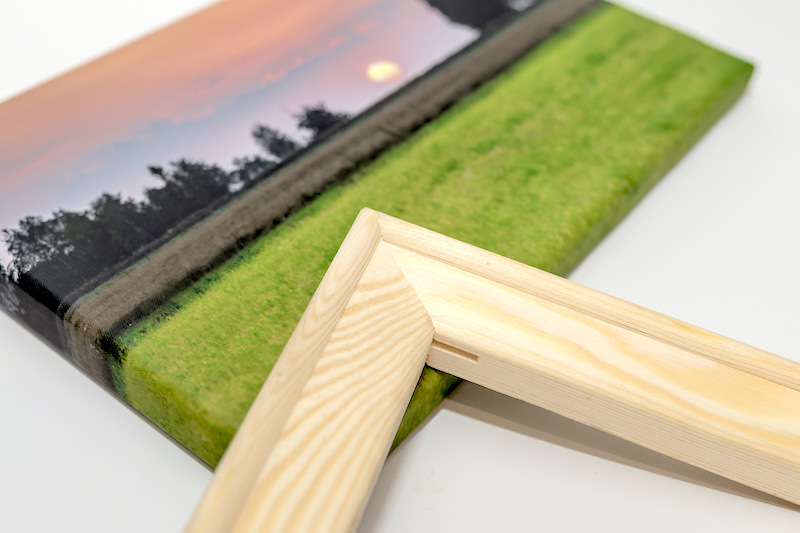 If you use paper or fabric to cover the canvas, flip over and smooth from the back, inside the frame. Make sure you use a craft mat to cover your table for this reason. Use any Mod Podge formula you like. Our formula guide will help. Brushstroke Mod Podge is great for when you're done and you want to add a bit of texture to the canvas. 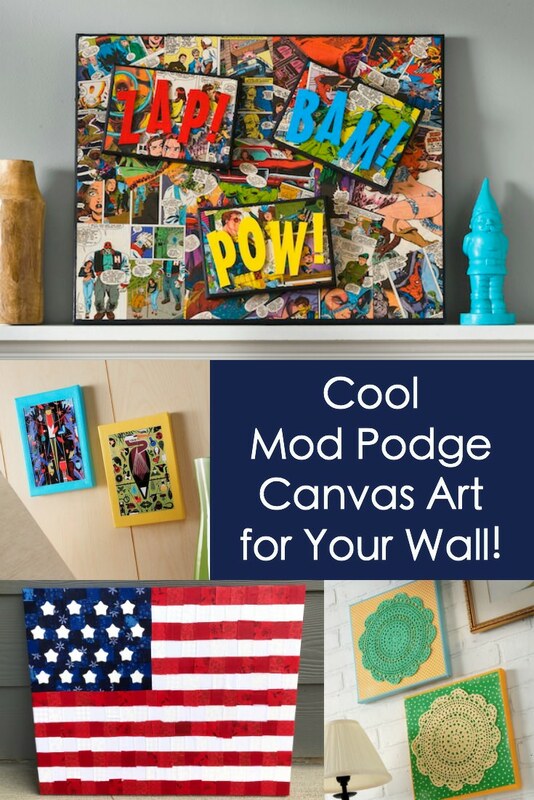 Now enjoy these Mod Podge canvas projects – just take a peek at the projects below, and click on your favorites to see them! Use comic books (or color copies!) and Mod Podge to make this DIY superhero canvas craft - a great gift for guys or any comic book lover! This photo strip canvas makes a great gift, and you can customize it with portraits of your pets, friends, or family members! Add a unique, personalized touch to your home decor with this monogram canvas! It's easy to make with a few simple supplies. 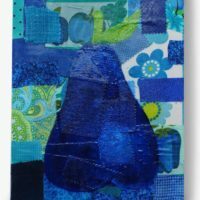 I made this Mod Podge canvas art by adding a ton of patchwork fabric shapes to canvas with Mod Podge, then painting a fruit right on top. 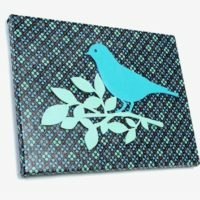 These paper bird faux paintings are pretty - you just need some decoupage medium and your favorite scrapbook papers for this easy art. Charley Harper is one of my favorite artists of all time - so it's natural that I would make this DIY canvas art using some of his prints! 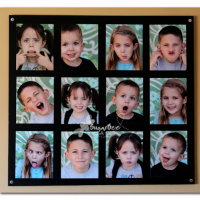 Turn important family rules into a cute piece of wall art. 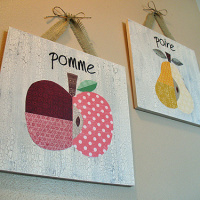 This Mod Podge canvas art was inspired by a popular online store - it looks great and costs a fraction of the price. 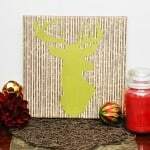 If you have leftover tissue paper you won't be using for presents, turn it into wall art with Mod Podge. 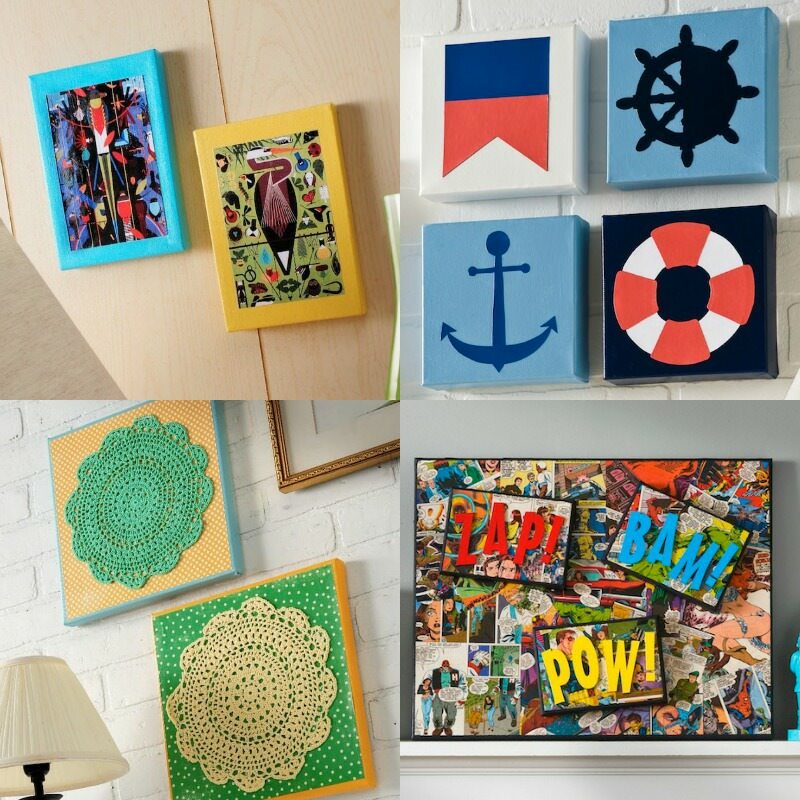 Use 12 (or more) of your favorite images to create personalized Mod Podge canvas art to hang in your family room. 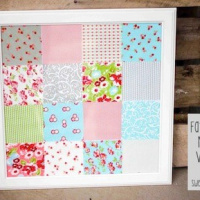 Create a unique floral collage on canvas using your favorite paper or fabric scraps. 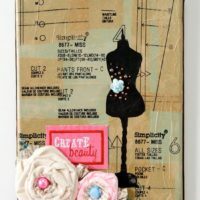 Courtney used scraps from fat quarters and Fabric Mod Podge to make this easy wall art. 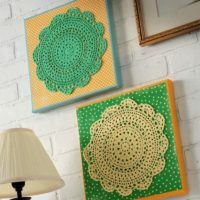 I created wall art using scrapbook paper doilies from the dollar bins at the craft store. Are you inspired by seaworthy decor? 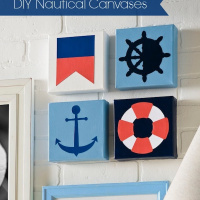 This nautical wall art is easy to make with Mod Podge - and uses a fun color palette. If you can use Mod Podge then you can make this DIY sunflower wall art - and all you need are pictures from your printer! This is so easy. 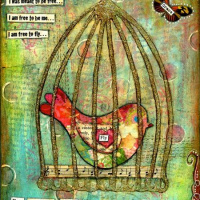 Debbie will show you the easy way to get a mixed media effect - and the result is this beautiful bird canvas. Are you wondering how to decoupage napkins on canvas? Learn how to do it with this emoji canvas project. Such a fun idea and very easy! Ready to decoupage on canvas? Grab a canvas here and get started with one of these 20 ideas! I love all these ideas! I used small canvases and mod podge to make some great christmas presents this year. great round-up and thanks for the feature!! and now I have a couple of new ideas…. Thanks so much for the feature! A lot of great ideas here! I remember that painted pear canvas!!! What a great collection of some really cute art. I’m excited to visit them all to see how they did it. Thanks for sharing! Love these ideas! Ready to take them and run! I am really motivated to try one of these soon! 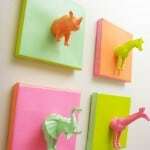 just popped over here to find out about some modpodge ideas and found my diy! thanks for the feature, it’s very flattering! How many layers of modpodge would you use when decoupaging fabric to a flat, textured (in other words, the original finish is not slick) plastic surface? I am thinking: two. Sound about right, or has experience taught you to add more? Hi there Hovawart! That is going to be tricky, because plastic is hard – but I would try at least two layers. You’ll know quickly if it’s going to work or not. Great ideas! I’m going to be using a lot of Mod Podge this summer! I’m having trouble with my photo paper buckling up when I put modge lodge on canvas??? Help! Hi Anonymous! I would make sure that you are putting enough on – you need you use a lot more on canvas than on wood. THEN I would turn the project over and smooth from the inside of the canvas. THEN let dry for 15 – 20 min before applying a top coat! 1) test to make sure the paint isn’t going to chip off easily; if it doesn’t you’ll need to sand it all the way off. 2) sand lightly anyway and possibly use a primer, especially if it’s oil paint. Another consideration is the texture of the painted canvas. Is the paint that was on it dimensional? If it was, you’ll be able to see those lumps unless you send them down. And Mod Podging to canvas always requires A LOT of Mod Podge. Put a lot on and then wipe the excess away from the edges as you smooth! Maybe someone has asked this already… I used mod podge to stick a photo to a canvas (the fabric on frame kind of canvas). I only put mod podge on the canvas (not on the photo) and stuck it down. About 2 days later the photo started to bubble. Should I have put mod podge on the photo too when I put it down on the canvas? Can I still put mod podge on top of the photo and will the bubbles disappear or do you have to put mod podge on the photo while the mod podge on the canvas is still wet?? Hi Monica! There are a few things. First of all, you have to use A LOT of Mod Podge on canvas because it soaks in, so yes, you probably should have put it on the photo as well. Also, if it was a “real” photo, it’s probably not going to stick well because there is a coating on photo paper – so a printout on regular paper would have been best (don’t know if you used photo paper or not). If it’s not a real photo, you can put Mod Podge over the top and see if the bubbles go away. If not, you’ll have to start over. Good luck! PS – you can watch my videos here: youtube.com/modpodgerocks. They might help you. Hi Amy, I love Mod Podging on canvas too. 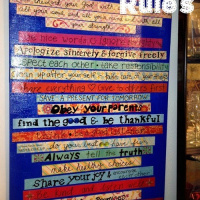 These ideas are really great, especially the family rules wall art. The possibility is limitless and what you need is creativity to come out with your own ideas! Hi Amy! I’m a new follower. I absolutely love your canvases! They are amazing! I work with mod podge and find it rocks, just like you said. Thank you for sharing. 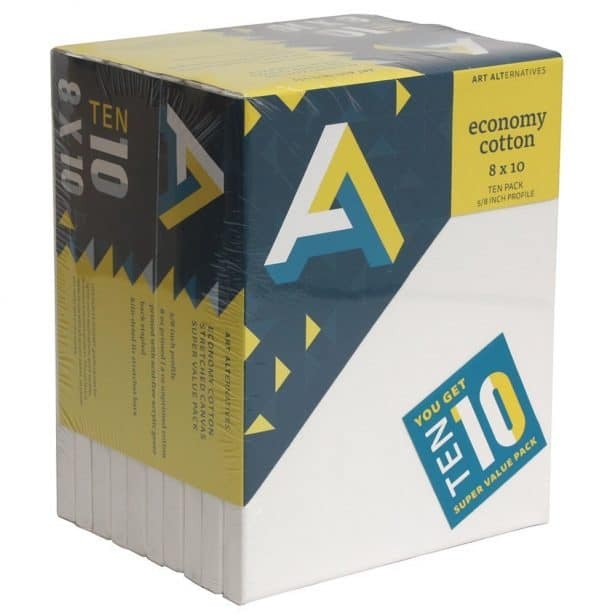 Can I use mod podge to attach strips of fabric to Styrofoam for fabric balls? Thank you for sharing…this makes me feel as if i can do it! I am going to give it a try! 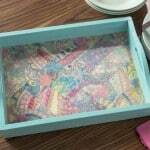 Can you use mod podge to put pictures on a glass table? Hi Rachel! Yes, you can. I want to send a photo to Walgreens to be made into a 24 x 26 poster and then Mod Podge this to a canvas. Think this will work?! – and if so, is a 32 fl. oz jar enough? Help…this is my first project with Mod Podge!! Hi CJ! You can definitely do this (and an 8 oz. 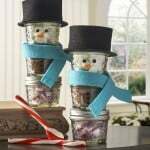 jar will be enough) but if you’ve never used Mod Podge I encourage you to try another project first. At least do a small test to work with it to make sure you are comfortable getting out wrinkles, etc. I don’t want you to ruin your print. And my first project was a bust! Very fun, I love the doilies and I bet Mod Podge would be great for them! 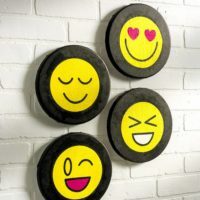 The circles are also soooo fun, may have to try that–wonder if paint store chips would work?? There are some really awesome canvas in this collection! 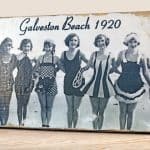 What is the best way to mod podge photos onto mdf? I’ve tried it a few times now but keep getting bubbles, which by the way I would LOVE to know how to get rid of??? Some small bubbles, others quite big. I put mp on the board and to the back of photo, but maybe I put too much??? Cause if I try to rub the photo down with fingers or cloth, I get finger prints vs colour rubs off.. Please heeeelp!!! Super thanks!!! I would like to make a canvas family photo with one of the recent pictures we had done and I am not sure which is the best way to have the photo printed cause I have seen some that some people use ink photos and others use poster which do you think will work better? I have never done this before so it will be my first time and I love the way the gallery wrap looks that are sold online … is this something I could do if I print the picture big enough to go around the whole canvas? Thanks so much for your help and advise :)! Hi Heather! Laserjet is your best way to go if you want to Mod Podge it down (no smearing) and also I wouldn’t go for gallery wrapping unless you are a pretty seasoned Mod Podger. It’s difficult to wrap paper around canvas. Hi I need a lil help here with the mod podge. I have a 12 by 12 canvas. 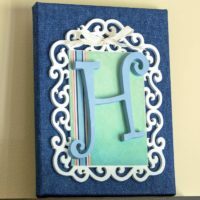 How do you put scrapbook paper on the canvas properly without the bubbles? Hi thanks so much for the advice! I look forward to seeing more of your crafts , keep up the good work !! i am a preschool teacher. This yr the kids made gingerbread men ornaments and painted them. Can we use modge podge to apply photos of the kids faces on the ornaments? The surfaces of course are not flat or smooth made by 3 yr olds. How would you apply the pics of the faces on? And the pics are on plain printer paper. Wonderful and fun filled!! Thanks for this beautiful idea. Love these! I recently came across some sample wall paper that I want to turn into wall art. Will mod podge work on wall paper too?